In my July 9 post, I proposed that one-way cities might ameliorate the detrimental effects of extreme income inequality, while also avoiding the inevitable increase in greenhouse gas emissions that accompanies higher income, is to provide affordable services and amenities. Affordable housing is a great place to start and it is an opportunity for municipalities to take charge. In his comment to my posting, Maurie Cohen pointed out that affordability is not enough; that access to other amenities that collectively amount to a high quality of life must accompany any such initiatives. I agree. This is why in this posting I describe a very special place in New York City: a model of affordable housing, a thriving community, high quality of life, and not-too-big carbon footprint. I argue that affordable, ecological and socially thriving living is possible even in very expensive cities, but it requires a new financial model of ownership, profit-sharing, and management of housing. A few blocks south of Penn Station — the main intercity railroad in New York City — there is a housing development known as Penn South. Its formal name is Mutual Redevelopment Housing. It is a limited equity cooperative development in the Chelsea area of Manhattan. Built in 1961 by the International Ladies Garment Workers Union, with an invaluable support from the City of New York, this cluster of ten 24-story high buildings houses 2820 apartment units for moderate and low-income residents. Monthly charges are about one-third of market rates. And like all very dense urban conglomerations, the greenhouse footprint of the residents is much smaller than in sprawling car-dependent suburbs with large single family houses. I know some people who live in Penn South. I consider it a perfect urban ecosystem and community: the buildings accommodate public indoor spaces for childcare facilities and health and recreational activities; 65% of the land is reserved for open space (yes, in Manhattan! ); the magnificent tree canopy feels like a park; there are playgrounds, basketball courts, meticulous landscaping, and flower and vegetable gardens. On warm days, benches are full of people talking to each other; neighbours inquire about families and keep an eye on the children. Jane Jacobs would surely like this place, despite the buildings’ heights she was so weary of. Penn South is a diverse community of all ages, races, and ethnicities, actively engaged in self-management of their commons. There are numerous self-help organisations, including those helping the elderly. For modest fees, you can sign up for a woodworking shop, yoga, and other activities. You can buy theatre tickets at a deep discount. You can watch a recent release movie for free. On one recent evening, the place was aglow with a million fireflies, which for some reason made the Penn South ecosystem their home. I would like to live in Penn South but it takes fifteen to twenty years on a waiting list to qualify for an apartment. How does Penn South, with its red brick cluster of ten identical high-rise towers, avoid the feel of a “project” (the term conjuring an image of ghetto-like clusters of low-income housing, often crime-ridden)? For one thing, it is a democratically run cooperative, the occupants of which have an equity in the collective and in their common future. Second, it is located in the centre of the city, totally integrated into its life and infrastructure. There are no boundaries, real or de facto, around it; other buildings are interspersed with the Penn South buildings, including two small ancient churches. For a passerby on the street, this is not a “project” but simply a continuation of city landscape of tall residential buildings. But it is the history of Penn South and its financial model that are at the heart of its continuing success as an urban community. Penn South was built in 1961 by the International Ladies Garment Workers Union (ILGWU) to provide good quality apartments and dignified living for workers in the then thriving New York garment industry. The photographs taken at the ribbon cutting ceremony show President Kennedy at the speakers’ podium and Eleanor Roosevelt sitting next to him, squinting on that sweltering summer day. From its very inception, Penn South has operated as a limited-equity cooperative. It is owned and operated exclusively for the benefit of the member-shareholders, who are the occupants of the apartments. Each member has an equity investment in proportion to the size of the unit he/she occupies (by New York standards the equity up-front payment is very modest), and is obligated to sell the apartment back to the cooperative when moving out. Each apartment constitutes one unit with one vote, irrespective of the size of the apartment or number of shareholders who reside there. The City of New York has helped to keep Penn South affordable from the very beginning through tax abatements during the first twenty-five years and thereafter through a gradual phase-in of real estate taxes at a reduced rate which is tied to the co-op’s income rather than the open real estate market (which has recently skyrocketed in that part of Manhattan). But the lure of windfall profits that might accrue to the current occupants if the development went from a limited equity cooperative to market rate casts a long shadow on Penn South’s future. Other similar co-ops in New York have already been privatised. Fifteen years ago when the most recent vote on Penn South’s future was taken, an overwhelming majority of residents voted, and of those an overwhelming majority supported the co-op system. But that guarantees the current status only until 2022 under the current contract with the City. Determined to keep the commercialization at bay, the management recently evicted a cooperator who used his apartment as an AirB&B. 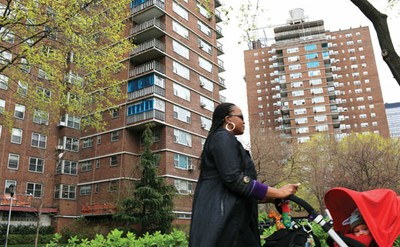 For now, Penn South is safe as a co-op for the middle class and low-income New Yorkers. I hope that it will continue that way. The reality is that the market cannot produce affordability in affluent cosmopolitan cities like New York. The best it can do is to set aside token “affordable” apartments which are subsidised by more affluent neighbours. And the market certainly cannot produce a thriving community of people who together build a collective good life. Progressive cities that wish to address consumption, inequality and quality of life must confront this reality. This is an opportunity for municipalities but also a great challenge. The dominant financial model of ownership, profit, and management is misaligned with progressive municipal social agendas and needs to be radically changed. But this will require a vision and leadership from the non-governmental sector as well, partnering with a municipal government. With the labour unions in retreat, I find it hard to envision them taking on that role as ILGWU has over fifty years ago. Who, then? Halina Brown makes an extremely sound case favoring the development of more Penn South-like residential communities as a way to create conditions for good life for people in the lower- and middle-income quintiles. I applaud her contribution and a broad-based commitment to such a program will unquestionably help to ameliorate the consumption challenges imposed by growing income inequality. But what about the upper end of the spectrum? Will NYC’s hedge fund managers and other high fliers be content to live in these locales or will they simply abscond to ensconced enclaves like, forgive me, Trump Tower where they will perpetuate their patterns of outsized and decadent consumption? What can municipal governments do to deflate the consumptive capacity of upper-income residents while simultaneously lifting up those who are less fortunate? One way to do so, while also encouraging residential integration across income levels, would be to build reasonably-sized duplexes and penthouses into the next generation of Penn South so that there is some variation in housing type, and from a pragmatic perspective I would, within certain limits, not be opposed to such measures. I am afraid, though, that they might not be sufficient. A more forceful option would be to look to the property tax which most cities in the United States rely on, to a greater or less or extent, as a source of public revenue. As a general rule, this levy is calculated by multiplying two factors: the assessed value of the property and the mill rate (the amount of tax per dollar of assessed value). Assessments are recalculated only periodically—and often with great political contentiousness—so most local governments annually adjust the mill rate to balance the budget. The mill rate is typically applied across all properties in a jurisdiction so that owners of more modest real estate pay, as a proportion overall value, the same amount as titleholders of pricier holdings. Under such circumstances, the system of property tax deployed in the United States has been recognized as notably regressive. In other words, it exacerbates rather than reduces income inequality. How might a more progressive property tax work? As a start, it would be based on a graduated mill rate so that owners of increasingly tonier properties paid an annual tax that was a larger proportion of assessed value. This type of property tax could provide a clamp at the top of the income distribution while, at the same time, addressing some of the wicked aspects of income inequality and fostering more sustainable consumption. To be sure, such a proposal would likely be denounced as confiscatory and worse, but history offers some succor in the sense that what is deemed to be “fair taxation” varies temporally and geographically. As Bill Rees reminded us in his keynote presentation at the recent SCORAI conference, the income tax rate for the highest-earning households in the United States was, prior to the early 1980s, set at 90 percent. Of course, there were various loopholes and semi-legal dodges, but the point is that there was a time not long ago when the federal income tax in the country was far more progressive than it is today, and public sentiments on the subject could in due course shift again. Interestingly, it turns out that a graduated property tax is not an entirely new idea. A bit of quick research revealed that a proposal very much along these lines was on the table just last year in the western Massachusetts town of Great Barrington (http://theberkshireedge.com/graduated-property-tax-concept-grilled-at-public-hearing-finance-committee-votes-to-retain-flat-rate). I suspect that more careful investigation would turn up other cases. It would thus seem that that municipalities concerned about the dual problems of income inequality and sustainable consumption could make significant headway with a policy package providing for the construction of amenity-rich residential communities like Penn Sound and a steeply progressive property tax. Nota bene: By coincidence, the New York Times reports today that the market for $10 million-plus apartments in NYC has apparently begun to collapse due in part to more rigorous enforcement by tax authorities (http://www.nytimes.com/2016/07/12/realestate/luxury/slow-times-on-billionaires-row-as-the-8-digit-boom-fizzles.html). Very interesting. Thanks! The ILGWU dimension is really fascinating. I’ve run into people who start collective housing projects but they have very little interaction with history. It is hard to find “best practices” for co-ops. The ones I knew (not a scientific survey here) were very demanding. Residents had to attend a lot of common meals and meetings that would not end until there was consensus. I hope word about this gets around. Previous Previous post: Is sustainable consumption compatible with increasing the income among the poor and the middle class?